Artist's concept of re-entry to Earth's atmosphere. NASA hasawarded the thermal protection system design and development contract to theBoeing Company; Fiber Materials Inc. (FMI) will be the principal subcontractor.The new TPS design will be used with the Orion crew explorationvehicle - the spacecraft that will take astronauts back to the moon. NASA Ames Research Centerhas awarded the $14 million contract for the development of a phenolicimpregnated carbon ablator (PICA) heat shield. The PICA shield was first usedon the Stardust interplanetary spacecraft launchedFebruary 7, 1999 to study the composition of the Wild 2 comet. It successfully reenteredEarth's atmosphere January 15, 2006. The capsule was traveling at 28,900miles per hour (46,510 kilometer per second), the fastest reentry speed everachieved by a man-made object. FMI fabricated the heat shield for the Stardustsample return capsule. 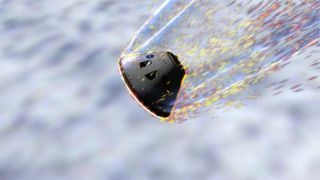 The ability to survive highspeed reentry is an important consideration for the Orion spacecraft. Orion isintended to perform lunar-direct returns, which result in considerably higherspeeds; the spacecraft will need to withstand about five times more heat thanexperienced by spacecraft returning from the International SpaceStation. The best protection againsthigh heat flux is an ablative heat shield. The extreme heat of reentry causesthe material to pyrolize - the chemical decomposition of a material by heatingin the absence of oxygen. As the PICA chars, melts and sublimates, it creates acool boundary layer through blowing, protecting the spacecraft. The first work on thetechnology of reentry was done in the early stages of the cold war.Intercontinental missile warheads would evaporate during reentry unless aprotective technique could be found. Work that began at Douglas AircraftCompany's Project RAND in 1952 suggested that ablation cooling would be thebest technique. There is an interestingscience fiction precursor to the idea of ablative cooling. In his 1934 novel Triplanetary,E.E. 'Doc' Smith wrote about a technique for jumping out of a supersonic planetraveling at 2,000 miles per hour in near vacuum. ...He curled up into one half of the ball; the other half closed over him andlocked. The hatch opened. Ball and closely-prisoned man plummeted downward..
...a synthetic which air-friction would erode away, molecule by molecule, sorapidly that no perceptible fragment of it would reach ground. Edward Elmer Smith had adoctorate in Chemical Engineering; that's a good place to start in writing hardscience fiction. Take a look at moreideas from 'Doc' Smiths Triplanetary. Find out more about Boeing'sheat shield contract ; learn more about Atmosphericreentry.